When I think about probiotics, I am reminded of the advice I received when I had to take a strong antibiotic as a teenager. I was told that to counteract the effects of the antibiotics on my body, I should also take a probiotic. I remembered this advice when Zachary and Simon both were prescribed strong antibiotics for infections. What I did not realize is that some doctors recommend taking probiotics all the time, not only if you are also taking an antibiotic. For example, Dr. Ohhira’s Probiotics are all-natural and developed to support digestive comfort, nutrient absorption, and a healthy immune system and are said to help bring your body into a healthy overall balance. If you are like me, you probably don’t know much about probiotics in general, so let me back up a bit. What are probiotics anyway? Everyone has bacteria in their intestines. Without certain bacteria, such as the ones found in cultured foods, may have issues with Candida, weak immune systems, poor sleep patterns, and more. There are many factors that can interrupt the balance of intestinal bacteria (also known as intestinal flora), including taking antibiotics, drinking chlorinated and fluorinated water, stress, diets high in sugar and carbs, and more. Problems with unhealthy intestinal flora may be seen in the body in the form of acne, eczema, allergies, bad breath, gum disease, fatigue, yeast problems, difficulty losing weight, acid reflux, frequent colds and illnesses, constipation, joint pain, poor sleep patterns, etc. I feel like many of us have at least some of these issues. Because many of our immune system cells are found in the digestive tract, probiotics can support these cells by helping to crowd out unhealthy bacteria. This can create an overall healthy immune system response. Dr. Iichiroh Ohhira developed a product line of probiotics after over a decade of research. The formula is based on a traditional Asian fermentation processes and contains both live probiotics and their prebiotic food supply. Dr. Ohhira’s Probiotics are not cultured or grown in a laboratory. Ingredients such as mountain spring water, fruits, and vegetables are fermented for three years with 12 distinctive probiotic strains. This allows the supplements to deliver viable probiotics and that encourage your body’s innate ability to grow its own friendly bacteria. Dr. Ohhira’s Probiotics are made of pure spring water, fruits, wild vegetables, mushrooms, and seaweed. The benefits of Dr. Ohhira’s Probiotics include balancing your bacteria, relieving gas and heartburn, maintaining healthy intestinal pH and digestive functions, supporting the absorption of nutrients from food and supplements, and supporting a healthy immune system response. The capsules come in blister-packs that are stable at room temperature and are not freeze-dried. Dr. Ohhira’s Propolis Plus is another dietary supplement that is a fusion of antioxidant and immune-supporting components that is combines Brazilian green propolis with flax oil Omega-3, prebiotic and probiotic support, and antioxidants vitamin E and astaxanthin. This supplement targets immune system response, digestive support, and antioxidant systems and is ideal for people with multiple health goals including joint comfort, immune support, healthy nervous system function, and cardiovascular health, as well as overall digestive health. Dr. Ohhira’s Essential Living Oils are a vegan alternative to Fish Oil. Essential Fatty Acids are needed to survive and must be acquired from food or supplements. They support nutrient absorption and the integrity of cells and therefore influence the health of all major body systems and organs. To achieve whole health benefits, it is important to ingest a balanced ration of Omega-3, 6, and 9, but most people tend to get an imbalanced ratio in their diet, with their Omega-6 intake much higher than their Omega-3 intake. Fish oil and fish are good sources of Omega-3, but since many people don’t like fish or are vegan, Dr. Ohhira created this vegan alternative. The benefits include maintaining healthy cholesterol levels, promoting heart health and supporting arteries, supporting the body’s normal inflammation response, supporting a balanced immune response, maintaining bone and joint health, maintaining healthy intestinal lining, and supporting dermal health. These Essential Living Oils are derived from vegan oil and seeds such as rice bran, sunflower, avocado, flax seed, olive, and tea seed. They provide vitamins A, B1, B2, B6, D, E, and K, calcium, phosphorus, iron, and potassium. Dr. Ohhira’s Probiotic Kampuku Beauty Bar nourishes the balance of the diverse micro flora on the skin’s surface. It provides nutrients like amino acids and vitamins and minerals to support dermal health and balance. The benefits of supporting dermal probiotic health include maintaining dermal pH, maintaining the appearance and integrity of collagen fibers, promoting healthy skin cell rejuvenation, hydrating and replenishing the skin, and supporting the skin’s healthy barrier function. The Kampuku bar is chemical-free, moisturizing, probiotic, and natural deodorizing. It can also be used for shaving to avoid razor rash! 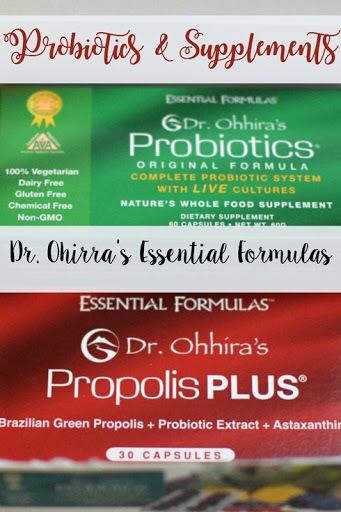 Because probiotic supplements need to be taken for at least three months to achieve the most extensive benefits, I cannot tell you any amazing stories that I have encountered after I began my trial period of Dr. Ohhira’s supplements. However, some immediate benefits in soothing occasional heartburn and digestive discomfort can be seen. While I don’t normally suffer from heartburn, I did have heartburn twice in the recent weeks before I began the probiotics, and I have not had any since. Because I don’t often get heartburn, I can’t promise that the reason I haven’t had any is because of the probiotics, but it does seem that a major benefit of them is to support your digestive system. The instructions on the packages are easy to read and the capsules are easy to remove from their blister-packs. If you are looking for supplements, I recommend trying Dr. Ohhira’s! Dr. Ohhira’s is having a special promotion!